Victorian Horror? High Fantasy? Espionage? Galaxy-spanning Space opera? The Cypher System Rulebook adapts the Cypher system - the critically acclaimed, award-winning rules set that drives Numenera and The Strange - to an unlimited range of campaigns and genres, giving you the complete rules and hundreds of character options, creatures, cyphers, and other resources. It's everything you need to play virtually any game using the Cypher system! 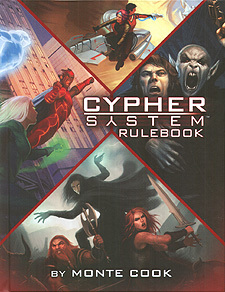 Take the Cypher System to the limits of your imagination with this hefty rulebook that extends the system to fantasy, science fiction, horror, and modern superhero settings - or any setting you can imagine.